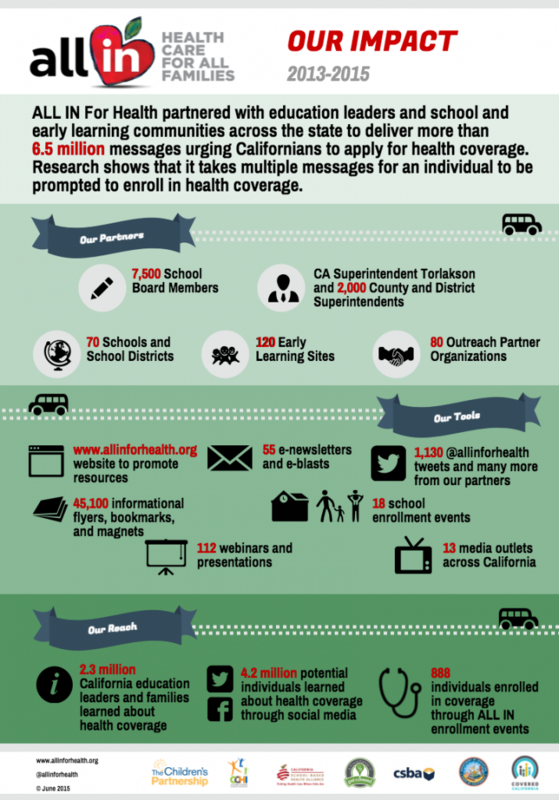 When the education and children’s health advocacy leaders in California came together two years ago to partner for student and family health, no one knew what the outcome would be. As California was preparing to roll out new health coverage options for families and individuals as part of health care reform in summer 2013, California State Superintendent of Public Instruction Tom Torlakson partnered with The Children’s Partnership. Together, we called on the state’s education leaders to work with child health advocates to help families connect to new health coverage options. The message was that no one knows better than teachers, school personnel, and other education leaders that healthy children make better learners. As a result of this call to action, The Children’s Partnership launched the ALL IN For Health Campaign with a simple mission: equip schools, early learning centers, and after-school programs with the tools they need to help more kids and families enroll in health coverage. At the time, California was gearing up to launch its first open enrollment period through Covered California, the state’s Health Benefit Exchange, and provide more Californians with coverage through expanded Medi-Cal, California’s Medicaid program. With new affordable health care options coming to families across the state, ALL IN For Health identified schools, early learning centers, and after-school sites statewide as places where thousands of families could learn about their new options and find out how to enroll in a plan that meets their needs. This model has proven to be highly successful; over the last two years, with our partners in the education community, ALL IN For Health has delivered more than 6.5 million messages across the state informing families about health coverage options and how to enroll, and encouraging them to take action to get covered. Research has shown that consumers need to be prompted multiple times before they enroll in coverage, making ALL IN’s voice an important one in the push to get more Californians covered. In the past couple of years, we’ve learned some valuable lessons about what works in partnering with the school community to reach families and students with important health information. For example, we learned that partnering with well-respected leaders in the education community and offering them an easy-to-implement game plan with off-the-shelf materials is vital for getting buy-in and making sure these leaders can easily engage in outreach activities. We also learned that speaking the schools’ language and tying activities to the school calendar really works in getting more families enrolled in health coverage. Check out our Summary Report for more details on what we’ve learned and ideas for how you can bring a campaign like ALL IN to your community. Not convinced yet? The numbers in our infographic speak for themselves. Learn more about the ALL IN For Health Campaign.